I've been thrilled to see the media attention to consent, lately, especially this petition. But I haven't seen a lot about how we, as parents, foster a culture of consent in the home. And yet I'm quite sure it's the biggest piece of the puzzle. It's extremely important to be given, as children and adolescents, the tools and language to ask for and give consent, but how do we ignite the fire of self-worth in our children, so that they are prepared and comfortable using those tools and language? There is a lot in the media - especially in the pop culture our kids are consuming - that detracts from the idea of consent, so I doubt there's much we can do to effectively counteract that, other than to build our children up from the inside, so that their first instinct is to seek consent and protect their own interests. So how does our parenting teach or devalue consent? How about this: "Give Auntie a kiss." That's not an invitation - it's a command. Or "...if you don't kiss me, I'm going to tickle you!" Upon which the child initiates a game of kiss-denying and tickling. Some kids like to be tickled, and as consent-seeking parents we're probably careful only to play games like this with those kids who want it... after all, they're actively kiss-denying in order to get tickled. But for me this begins a stretchy grey area where consent is a game. That's frightening, when scaled up to adolescence. My kids and their uncle playing a favourite game: Present Feet! Every time somebody says "Prese-e-e-ent feet! ", everybody lifts their feet and laughs. There can be more bonding in such a simple game of copycat than in a kiss and hug. Five minutes spent attending and responding to cues from each other builds lifetime bonds. And just as the choice to lift feet at the cue is up to each child, so are the hugs and kisses that sometimes result. Even with infants, we carefully learn to read cues: newborns will turn their faces away or close their eyes when overstimulated or uninterested, and generally it's seen as unacceptable to continue feeding, tickling, massaging, etc. when they're expressing a lack of consent. I read a great article about this non-verbal consent-seeking among children, recently: Teaching Consent to Small Children. I like to think I've been pretty careful with requesting consent from my children with regard to physical and emotional issues. I try to be aware of their physical needs and wishes; now that they're older I ask before posting photos or details of their lives online, and I try to make the consent-seeking between their father and myself obvious, so that they can learn by example. But I fail, too - and frequently. The places my consent-seeking falls apart are when I'm rushed (for example, coerced un-gentle hair-brushing before we run out the door), and when I'm stressed, like when I nag them to go give hugs to relatives, or to do homework or clean their rooms. I threaten them: "We're not watching a movie until your homework is done"; "if you don't clean your room, then I'm phoning your friends' parents and cancelling their visit". At the moments I say these things, they all seem so reasonable, but at the core of these threats is a disrespect for my children's autonomy and self-determination. It's hard to change, but that isn't a reason not to. Why do we subvert consent? Why do these things matter to us so much that we're willing to threaten or hurt our own children? I think it has to do with fear. Fear of failure, maybe, on my part, but also fear of rejection. If you're a sixteen-year-old boy just venturing into the dating scene, maybe you're actually quite afraid of being rejected. Maybe putting your arm around the girl you feel attracted to doesn't feel nearly as frightening as asking her first. But maybe we can help our children feel a deep sense of self-worth, so that they understand that a rejection of touch does not demean the value of either individual, or even of the relationship. Consent is not only essential regarding physical or sexual touch; it's important always. It's important when our boss asks us to work late. She can ask, but she can't force or coerce. It's important when we give responsibility to others: if I intend to relinquish dinner duty for the evening, I need to ask my husband or kids ahead of time instead of just dumping the job onto them, without warning (guilty). Obviously we can't always avoid the ways we affect others' lives without consent, but the many small ways that we seek and give consent do influence the more serious situations, and the many small ways we give our children the respect and autonomy we want them to demand as adults does influence their ability to do so. My son attends school now, but when people ask if we're still unschooling, I say yes. I was struggling with this question for a few months - struggling especially with seeing my formerly inspired kid come home with homework he didn't want to do, and complain bitterly about the constraints put on his learning and direction by his school. That was a hard pill to swallow for both of us after six years of him choosing his own direction(s). But because of the social engagement he was getting (and loving! ), we encouraged him to keep going, and take the less desireable aspects as part of the package. At one point I was very upset at seeing him lose interest in science. He used to spend every day exploring sciences, but once in school, the directed parameters are so narrow, and yet the workload big enough that he felt he had no time to explore the things he cared about, and wasn't even happy with his teacher's admiration. He was very angry about science, and at some point told me that he just spent most of the work time in class helping other people to understand the subject matter, so he never got to do the things he wanted. I complained about this to my mother who, in her wisdom, reminded me that he's not there to learn science, but to learn to work in community, and to value the group. I knew she was right, but still struggled to accept his anger and believe he'd come through it. Despite my fears, small rays of light started to emerge during the last couple of months. One day he came home, dropped his bag, headed for the computer and said "I have to start my novel". Huh? He claims to hate writing! What was this about? He explained that he'd been thinking of this novel for four months, and now he needed to get going on it so he wouldn't forget some parts. He also turned 13, and decided to throw his own parent-free birthday party, in the woods. I can't tell you anymore about that, because I wasn't there, but he came home glowing. I began to feel more attached to these experiences than to how he was feeling about his classes at school, and I personally began to care less about the metrics of his supposed academic progress. His second term report arrived on the last day before Spring Break, but we didn't remember to check for it until he was in bed. "Do you want to come see?" I called to him in his bed. "No. I'll just see it tomorrow." He was absolutely uninterested! I was baffled, but read through it and realized that I, too, had become uninterested in the grades. I enjoyed reading what his teachers had to say about him, but the grades meant nothing to me. It was like a big slow wave of freedom washing over me. Then Spring Break was upon us. And with no homework!! Most weekends since school began, he has been uninspired to say the least, but spring break was different. Within twenty-four hours he had committed to do "science class" with his sister (wherein she picks a topic she wants to learn about, and they go learn about it, together), had gone back to some of his favourite activities (reading, making marionettes, animation, and science research), and he was happy. For two weeks we never talked about homework. We just lived. It was like old times, but with a happier boy, who now has a social network to participate in regularly, and who also has the freedom of living without an attachment to academic evaluation. I feel like I have my son back again. Taliesin and Rhiannon have been talking a lot about different types of periodic tables, data presentation, codes and languages, lately. Near the end of Spring Break they decided to draw their own periodic table, drawing from different sources to create something unique to their own vision. I took this photo because the moment I found them doing this was the moment I knew I had to write this article. This kind of self-directed, interest-led activity is the best. And by the way, the fact that this particular activity involved books and traditional school-y materials is just fine with me. There is certainly a place for those things, especially when they're wanted. 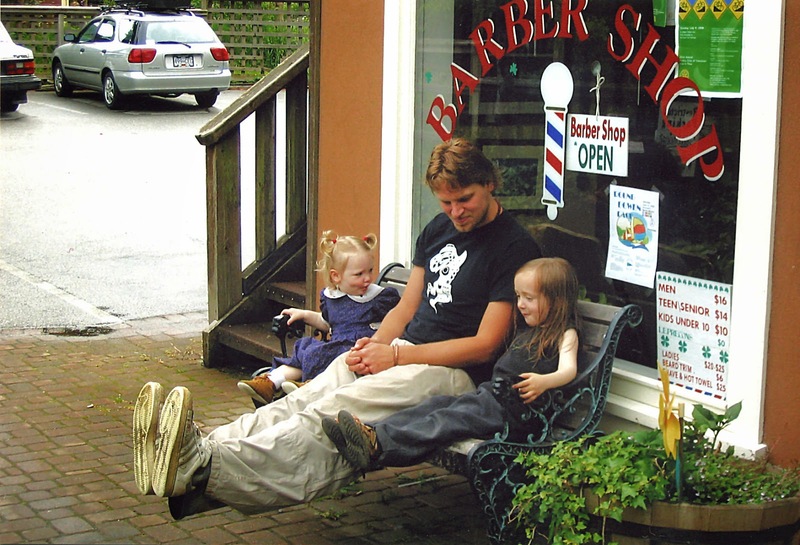 Unschooling isn't specifically 'lack-of-school', but rather a way of living. I did struggle for a few months with my son attending school. I felt like a bit of a fraud, I guess, and mostly I was just terrified of what the academic grading system would do to him. It turns out it's hard to drop into a rigid evaluative system and completely ignore the evaluation. But it is possible, and I know now that this process had as much to do with him detaching from the evaluation as it had to do with me detaching from it. We're still unschooling - just one of us goes to school right now. And he's chosen to go back next year, as well. Unschooling is about letting go of rigid developmental and societal expectations, learning to follow our hearts, and blossom in our own unique ways. Yes, it's about recognizing that adhesion to strict learning guidelines can be harmful to individuals, and yes, it's about acknowledging that comparative evaluation can be harmful to individual progress and engagement. But it also provides us with an inherent freedom of mind, so that we can navigate those rigid systems with our innate sense of curiosity and confidence still intact. It's about valuing ourselves. Basically, here's how it works: You park at the sign, drop your belongings in the house, and hurry to the beach! That's Mary's log and stone house in the background. Suburbia disguised by wilderness. Head down the trail and within about 30 seconds you'll find yourself in the Wild Pacific Cove. If it's high tide, walk around the shore; cross over to the little island if you can, and EXPLORE! If it's low tide, as it was when we arrived, EXPLORE!! Did I say explore?? Why yes I believe I did!! You might find you have a hard time getting back to unpack your stuff. You might find that other plans get pushed aside. you might even find, as we did, an excited Uncle waking everybody up with the sunrise on the first morning to go back out and EXPLORE!!! I cannot tell you how diverse and beautiful the discoveries are in this little cove. From the whistle buoy and bell buoy to the sea lions barking and waves crashing, the auditory experience alone is something impressive. The sun's colourful displays over the course of the day are a wonderful backdrop for exploration, and what delights we discovered!! If tidepools are interesting to you, you will not be disappointed; if seaside plants and stunted trees delight you, you'll be thrilled, and if a good solid climb through brush and branches is what you need, you can find it on the island. This place really has everything. Of course, at some point you are going to get cold, tired, and maybe wet, and you'll eventually go check out the house. The rooms are clean and spacious, the bath and electric fireplace are warm, the shelves are stocked with hot drink options, and everything is decorated with beach finds. The views from the rooms aren't amazing, but in my opinion are entirely made up for by the delights outside the door. The house we've been calling Mary's House, AKA the Wild Shores Guest House, is a perfect retreat for adventurers who want a clean, cosy space to curl up in after a day of exploring. And it appears to be one of the most affordable waterfront options, too. Since we were obviously so taken by the natural discoveries we made, and since a photo is worth a thousand blog ramblings, I'm going to fill the rest of this review with photos. Enjoy! The view from the south side of the island. Wild Pacific Cove and the north side of the island at low tide. ...and again at high tide! Uncle Adrian has a slightly severe bonsai habit. I didn't take many good creature photos at this beach, but the crevices are full of chitons, snails (and what a variety!!) sea stars, urchins, anemones, hermit crabs and other delights. But why stop at plants and life that clings to rocks?? You could bring your boots and discover fish and crabs, too. You might even find things you are completely unable to identify (suggestions welcome...). Or just gorgeousness to wake up your senses in the morning. Rhiannon has been enjoying geocaching, lately, and this was the main thing she wanted to do on this trip. So we saw that there was supposedly a geocache on Radar Hill near Tofino, and went searching for it. It was supposedly underneath something, 1.5 metres from the corner of "the" platform. However... there are three platforms, and they each have many corners. Multiply those by the many directions one could fan out 1.5m, and you have a big search in front of you. Here are Rhiannon and Markus checking whether it might be 1.5m underneath one of the platforms. Then, of course, you have some nice underneath platform photos, by Markus and Taliesin. so we stayed for lunch. Then we gave up looking for the geocache, and as you may have read earlier, we went looking for the crashed airplane in the bog. Truly, the airplane itself was a highlight (though outdone, in my opinion by the beautiful bog)... but as luck would have it, there was a surprise geocache inside the plane! Lucky Annie. She got a pair of scissors and left behind a die.